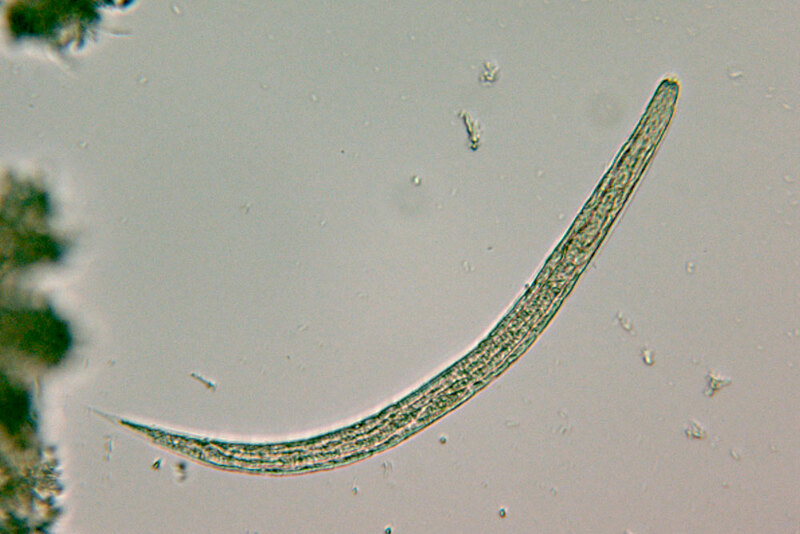 Strongyloidiasis is caused by Strongyloides stercoralis, a rather small but very special nematode with the capacity to multiply within the host! Infections can persist in the small intestine without any symptoms for many years. An overwhelming, disseminated infection – where larvae invade all tissues and disseminate gut bacteria – can result after an immunosuppressive therapy. Most people die from this “hyper-infection syndrome” due to massive autoinfection within the gut or via perianal skin! The adult female worms deposit their eggs in the mucosa. After hatching, first-stage, rhabditiform larvae (almost 0.5 mm in length) reach the gut lumen and are passed with the faeces. Under optimal conditions (humid and warm), they develop within 2 days to free-living infectious (filariform) larvae. They even have the potential to become sexually adult worms which mate and lay eggs. Third-stage larvae can actively penetrate the skin and migrate via venous blood to heart and lungs. After moulting they reach the alveoli, mount the trachea and are swallowed. Only parasitic females have been found in the intestine; they produce eggs by parthenogenesis.